You’ll have plenty to do when you’re on your road to recovery from drug or alcohol addiction. Your counselor’s recommendation that you maintain a regular journal might feel like busy work if you don’t understand or your counselor hasn’t taken the time to explain the benefits of a journal. Your recovery can challenge you with a bundle of conflicting emotions and feelings, and keeping a journal can be an effective tool to impose some order and structure that reduces the conflicts. You might experience shame or guilt over your addictions in the early phases of your recovery and you might be reluctant to record those feelings in a journal. If you bury those feelings, they may come back to haunt you at a later time. If you’re under additional stresses from other sources like your job or family then, the toxic combination of your repressed feelings and external stresses can easily cause a relapse. You’ll be better able to handle those external stresses if you’ve jettisoned the baggage of any negative emotions. Recording those emotions in your journal as they occur is a simple and effective method of managing them. You might not enjoy writing, or the writing process might take you back to your school days when you really didn’t enjoy the essays that your teachers assigned you to write. One beautiful aspect of a journal is that no one will grade it, and it can remain a repository of your private thoughts with no third party judgment. If you don’t know how to get started, remember that there are no rules, and no right or wrong way to record your thoughts and emotions. The process is more important than the end product. Frequently, you’ll start slowly, but then the words will begin to flow effortlessly. Set a regular time each day to work on your journal. If the words don’t come, put the journal aside and revisit it at the same time the next day. Research suggests that you might experience corollary health benefits from journaling, including an improved immune system, lower blood pressure and stronger organ functioning. Researchers may not understand the connection, but they have long suspected the link between a person’s general sense of well-being and his or her physical health. The inference is that journaling can help you organize your thoughts and feelings, which reduces your sense of anxiety. Your doctors and counselors will likely address any anxieties that are plaguing you during your addiction recovery. Journaling may be a preferable tool over anti-anxiety medications or other pharmaceutical approaches. 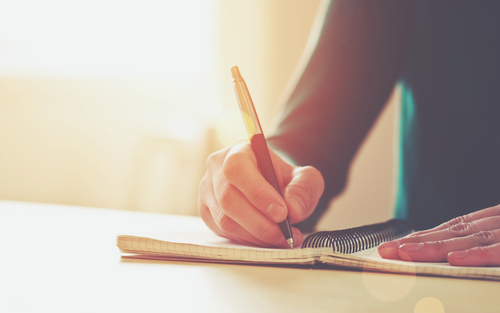 Your journal can provide positive feedback and reinforcement as you record your progress toward recovering from your addictions. It can also keep you accountable to your recovery by encouraging you to acknowledge your mistakes and the steps you need to take to remedy those mistakes. It can also help you develop some order and structure out of the chaos that your addiction likely caused in your life. If you’d like more information about using a journal during your addiction recovery or need help on starting your journal, please contact the staff at Hired Power at 800-910-9299.